Those of you who regularly read my blog know that this past week was dedicated to Pretzel Challah. It was a pretty big project, involving lots of testing to get the recipe exactly right. When I finally nailed it, I’d made a total of 6 pretzel challahs and a batch of pretzel challah rolls. Now, I love challah and I love pretzels, but that’s a lot of bread!! Normally I’d bake up a batch of my Challah Bread Pudding with all of that extra carby goodness, but pretzel challah is salty, so it won’t work in a sweet pudding. I gave away two of the challahs. Then I used the pretzel rolls to make mini grilled cheese sandwiches and served them with tomato soup, which was a yummy dinner. But I still had a lot of bread left over. What to do? Fondue, that’s what! There is something perfect about the combination of melted cheese and a pretzel. It’s decadent dairy deliciousness. Trouble was, the whole fondue thing was kind of new to me. I’ve made it before, but not often, and never with great results. I spent a morning pondering the process. It’s a simple concept, but there are plenty of things that could go wrong. Cheese can get lumpy, overly cooked, or stringy. You need the right proportion and types of cheese, a certain amount of acid, and a thickener to get the consistency just right. Tip #3: If you prefer to make the fondue without alcohol, you will need to add a non-alcoholic acid, like lemon juice. Proportions will vary depending on the recipe you’re using. I found that substituting milk for the wine and adding 2-3 tbsp of lemon juice seemed to work in converting recipes from alcoholic to non-alcoholic. You’ll need to experiment and see what works best for you. Tip #4: You will need a thickener like flour or cornstarch. If you’re keeping gluten free, a certified GF cornstarch is a safe bet. If you’re not worried about the gluten, feel free to use flour. Tip #5: Melt cheese in a pot on the stovetop before transferring it to the fondue pot. Tip #6: Shred your cheese before melting it. This will make the melting process smoother and easier. Tip #7: Dissolve your thickener into your wine (or liquid) in the pot before melting the cheese, mixing slowly over low heat. Make sure the liquid is smooth with no lumps of powder. I found it’s easiest to do this using a whisk. Tip #8: Melt cheese very gradually. Low, even heat is best. Add the shredded cheese slowly, one handful at a time. It will take a few minutes, but your patience will be rewarded with a smooth, tasty fondue. Don’t let the cheese boil. Tip #9: Before transferring the cheese from the stovetop pot to the fondue serving pot, rub the inside of the serving pot with a fresh garlic clove. This will give a garlicky essence to your fondue, adding extra flavor and aroma. For a more pronounced garlic flavor, mince up a clove or two and add it to the melted cheese. 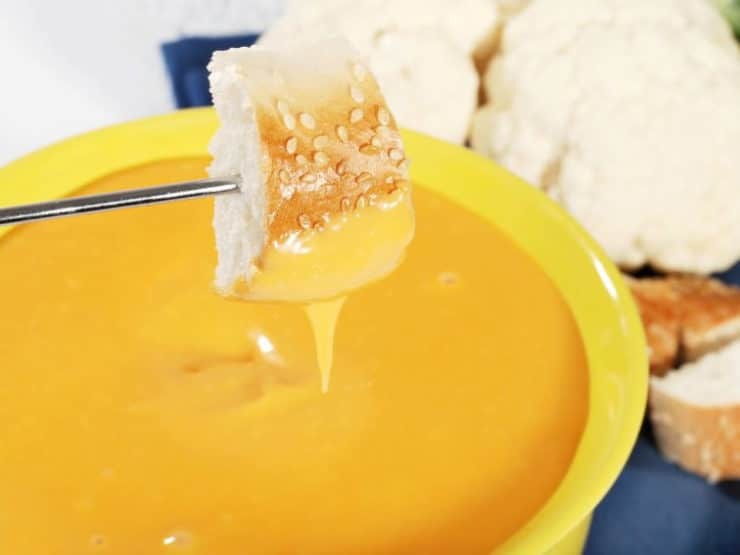 Tip #10: Serve cheese fondue with a variety of dipping choices. Cubed bread (like French baguette) is traditional. Lightly steamed vegetables like cauliflower and broccoli work well. Boiled or fried potato pieces are delicious. You can even get creative and dip fruits that go well with cheese, like sliced apples or grapes. 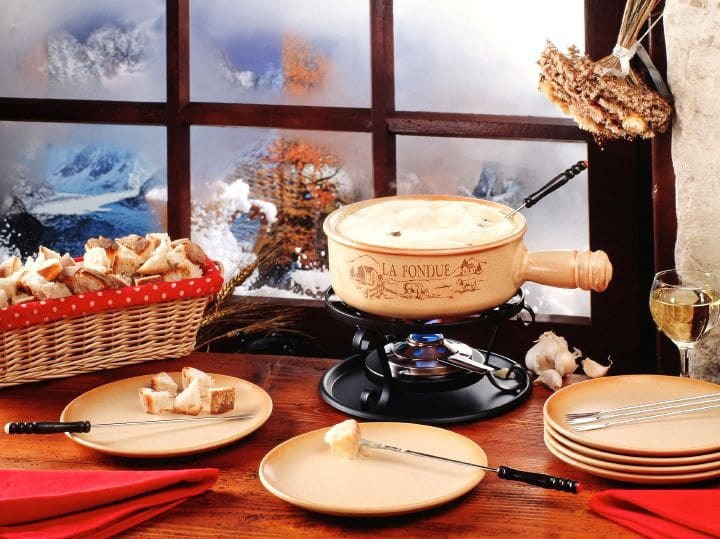 These tips should help you create your own tasty cheese fondue. I created one this week that is holy-moly-creamy-melty-amazingness– I call it my Cheesy Roasted Jalapeño Fondue. Give it a try! Hello, any advise how i can serve up a cheese fondue for 400 guests? Hi can I use one type of cheese for this recipe? Its just for myself as my partner is lactose intolerant. How many lbs of cheese would I need for 10 people please. I use 12oz to 16oz of cheese per person depending on how hungry they are. I do not recommend storing an already melted fondue on the fridge. You may keep the grated cheese a couple of days in the fridge, but before they are melt. Can you use beer instead of white in fondue? if so, do you use the same amount as wine? Hi Shenaz, either ceramic or cast iron will work. You shouldn’t use milk, there is no milk listed in the process above. Good luck! Suggestions for ratios of the cheeses referenced in the article? In particular between Gruyere Emmentaler and Swiss? Any of the wines listed go best with certain cheese ratios? Suggestions on places to obtain small amounts of kirsch? I typically use 1/3 gruyere, 1/3 emmental and 1/3 comte. And use a wine from French Savoie. You can find small/1-2 oz portions of kirch in good liquor stores. I am so excited about this!! I am having a grand opening on Saturday, and I know it will be a hit!! Thank you for all the good tips! I’m going to try it in my electric fondue warmer, too. I LOVE the electric ones – so much easier than monitoring a flame… Thanks for the simple recipe! Hey! I have never made cheese fondue before, so I have a few questions. What type of fuel did you use? How did you get it into the holder? Does the holder get really hot, because its metal, and should I use an oven mitt to pick it up? Hi Chlie, my fondue pot is electric so there is no fuel involved. Every fondue pot is different, so it’s difficult to give you advice unless I know what kind of fondue pot you have. Most pots have a fuel or electric source below, and the cheese mixture cooks directly in the pot itself, so no need to touch the pot until after you’re done eating. Can anyone recommend how much wine/liquid to use for one pound of cheese. I’ve seen this asked already but no responses to it. Thanks everyone for all the help one making our fondue making so great! Angela, use 1 cup wine and 2 tbsp cornstarch for 1 pound of cheese. Whisk together wine and cornstarch first in fondue pot till smooth, then melt in the shredded cheese slowly a handful at a time, stirring constantly. Thanks Tori, for the reply. So the wine temperature , as in fridge, doesn’t matter ? The first time i made fdondue i used a room temperature wine and it came out perfect. This time i followed the same recipe but took the white wine from the fridge. It became lumpy and the liquid separated. Hi Vaishali, in my experience it is the heat that can be problematic in fondue making, not cold liquid; however, just because I haven’t had your particular issue doesn’t mean it doesn’t exist. Extreme temperature fluctuations in either direction might be problematic. If you felt that room temperature wine worked best in the past, it might be best to use it in the future. I used cold white wine from the fridge to make fondue. It turned out very lumpy inspite of using Emmenthal and Gruyere. Should i use wine at room temperature , next time. Hi Vaishali, your lumpy fondue was likely overheated, which causes the cheese to curdle. Next time turn down the heat or heat it more gently to avoid lumpiness. I made a mistake at the store and bought emmetelar instead of gruyere. Will it still work OK if I mix it with a jalsberg?? And be really yummy? Becky- yes! It will taste great, both Emmentaler and Jarlsberg cheeses melt well for fondue. Of course, everybody has different taste when it comes to cheese, so you might want to try a bite of both to make sure you like them before melting. Enjoy! I don’t have any trouble making smooth, creamy fondue but I don’t know how thick it should be. The hard part is keeping it creamy on the table. The texture always changes. I’ve tried several cheeses and I get fondue that becomes one big lump of stringy cheese or it separates after I put it on the table. Is it the change in temp or maybe the thickness? Thanks for any help you can provide, I sure do need it. Emmenthaler cheese gets stringy, so to avoid that, make your ratio 60% gruyere and 40% emmenthaler, plus use both wine and kirsch, which are put in to keep it from stringyness. Use good emmenthaler. I’ve always had my fondues come out really well. Never use cheddar, it almost always strings, especially sharp cheddar. Mild cheddar melts well, but it does not add to the taste here at all. Stick with Gruyere and Emmenteler. Also love to use the dry vermouth. Sauvignon Blanc is the next best, IMHO. And most importantly, always add 2-3 Tbl of Kirsch. That’s what gives the fondue its true classic taste. Hi Kathy, I do not recommend making fondue ahead. You should make it just before serving. It only takes a few minutes to put together. To save on prep time, you can assemble your ingredients ahead of time and clean and chop any vegetables or fruit you plan to use. You mention in tip 1 to take a total of 1 pound of cheese. What is the quantity of the other ingredients used? I am looking to make the one without alcohol. So how much of lemon juice, cornflour? Seriously Tori, I am suppose to be going to bed but instead I am sitting her drooling over your recipes. I am now hungry again. You know your a rock star when you make someone so hungry they are considering whipping up fondue at 3 in the morning. You beat me to it–I have a fondue post waiting in the wings, too! I like the idea of rubbing the fondue pot with a garlic clove. Is there anything better then warm melted cheese? It could be better then chocolate to me. Thanks for all the great inspiration – now I want to throw a fondue party. Great tips! Fondue is a fall and winter favorite in our house. I use Emmenthaler and Gruyere, I cut the cheese (no giggles) into small cubes and toss the cubes with cornstarch so that the cubes are all coated. I usually use Rhine wine (it it my jug wine for cooking) and my fondue usually turns out great, though some of your pretzel challah sounds like a perfect complement! This is a very informative post. Helps the unfamiliar become familiar. I will need to try fondue! Your picture of the fondue on the table does look wonderful. Who doesn’t like wine and cheese-delicious. GREAT tips! I like to use both wine and a squeeze of lemon juice and I agree – garlic rubbed in the pot is a must. Now I need to make your amazing pretzel challah! These are excellent tips! I have always used beer in mine (a la Melting Pot), but I think I might try using wine next time!